CDM’s resident game composer W. Brent Latta continues pouring over the epic choral sampling library that is EWQL’s Symphonic Libraries. In case you weren’t already impressed with its 9 DVDs of sounds, in this episode, Brent constructs actual words out of samples — the holy grail of synthetic vocals. -Ed. 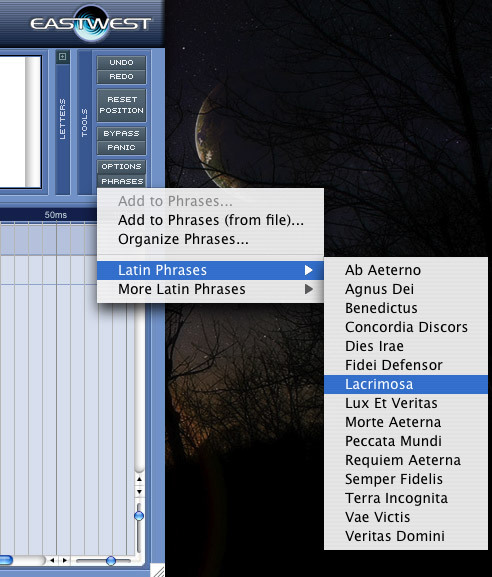 WordBuilder is arguably the most significant piece of technology in the Choirs package. Sure – in terms of raw samples, there has never been a choir library this substantial. But more important is the ability to actually get the choir to say exactly what you want them to, without resulting to bland “Oooohs” and “Aaaaahs” or resulting to bland, pre-recorded phrases such as “Hallelujah”. That said, our look at WordBuilder will be brief, only because the application is so deep that to fully explain its use and application would exceed the scope of a review and lead into something more of a tutorial. As we discussed in the earlier episodes, we’re using Choirs along with Logic Pro 7 – thus we use WordBuilder in standalone mode. 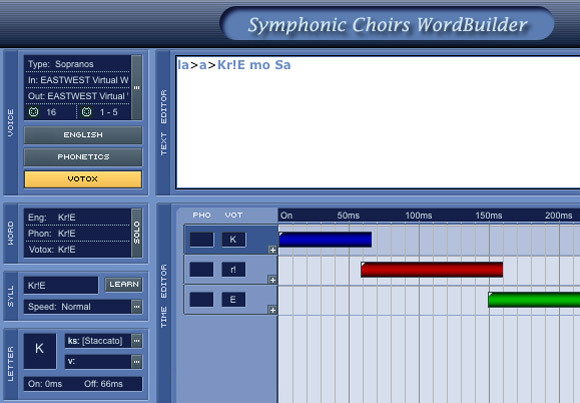 We fire up Logic, WordBuilder, and 4 instances of our Choirs Kompakt plugin (SATB), and begin our foray into building words. The first thing to understand about WordBuilder is that while a monophonic note-line will be routed in (from your controller or sequencer), WordBuilder will transmit much more MIDI data at output. Consider the word “sly”. The composer things of this as a single word or syllable, however WordBuilder must break this individual word into multiple segments, “s”, “l”, and “y” – each to be routed (with the same note value) to a different sample. Thus we can see that WordBuilder is a sophisticated MIDI processor, and harnessing its power is no small undertaking. The incoming note from your controller or sequencer will have a velocity value that will be passed into each segment in WordBuilder. However, we can change the velocity of each segment on the fly in WordBuilder, if we so desire. Even more useful is the ability to set transitions between segments and phrases. As noted in the documentation, “singing the word ‘alone’ might need to be noticeably different than singing the phrase ‘a loan’, even though the sounds of the letters are the same and the notes on the staff identical.” WordBuilder allows the user several ways to specify transitions between phrases, the most flexible being “Text Entry” mode, where entering symbols into the text field will specify the type of transition between segments. “had a lit-tle =lamb” would yield slurring on the first word, staccato on the next 3 words, and a normal transition on the final word. As a side-note, it should be mentioned that we can solo specific words or phrases to further hone and refine our performance. As we select a given syllable in the text field and click ‘Solo’ in WordBuilder, we then loop the particular notes in our sequencer, or simply play them in repeatedly from our controller. Perhaps the most important functionality of WordBuilder – aside from assigning the actual text to be sung – lies in its ability to ‘learn’ the timing of the lyrics to be sung. There are two basic approaches: Change Speed, which actually adjusts the duration of each phonetic segment, and Draw Only, which merely indicates the length of each syllable in the timeline. Each one is useful in its own right. 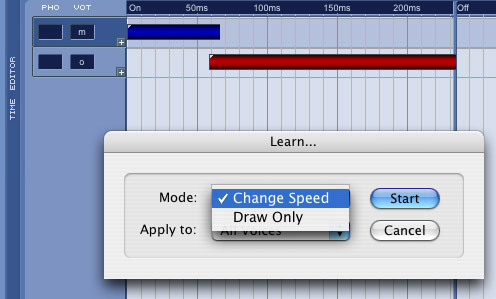 Change Speed is the most efficient way to get the choir to sing the lyrics with the melody you’ve written, though it is not necessarily precise enough to simply ‘set-it-and-forget-it’. Draw Only doesn’t change the actual duration of the segments – that type of adjustment is up to the composer. What it does is give you a guideline, a foundation from which you can adjust and tweak the syllables to your hearts content. Personally, I’m the impatient type, so I’m going to be working with the Change Speed mode, with manual tweaking after the fact. One nitpick I have with the documentation for WordBuilder – it constantly references the different colors of segments and notes, but the manual itself is in black and white. I realize that they assume the user will have the application open while they’re reading the manual, but that is a faulty assumption for some of us, who use our commute time (on the bus, mind you) to read through the documentation and our studio time to put it into practice. It should also be noted that there is one cumbersome quandary in the WordBuilder system that makes it somewhat difficult to get the lyrics to come out the way you want. When a single word or syllable requires multiple notes, the composer must toggle a MIDI CC event – one for “Hold On” and one for “Hold Off”. These toggles are set in the options menu – completely separate from the learned timing system used elsewhere. This dislocation of the hold system from the rest of the timing system is frustrating. Surely there must be a better way to incorporate held syllables over multiple notes within the primary “learning” system. I certainly hope East West refines this feature in the future. Here is a quick MP3 sample of the Lacrimosa phrase from Mozart’s requiem. As shown in the graphic, one must insert a separate syllable for the note to be held (the ‘a’). WordBuilder is a complex application, requiring proprietary syntax and a great deal of patience. However, it pays off in the end, and your results will be directly proportional to the amount of time you’re willing to spend refining your song. While I wish that it were easier for a composer to get a virtual choir to sing, I honestly can’t think of a more efficient or flexible way of doing it. East West has done an amazing job with this application, and I’m excited to share my results with you in our next, and FINAL installment.